Parents/students can avail of the optional prearranged shuttle bus from Dublin, Athlone or Galway. You will be notified when you should book your ticket if you wish to do so. Please no not book a ticket BEFORE you receive this notification as you will be charged and the ticket will be void. Details for booking the shuttle bus online are below. 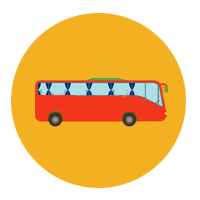 Do not book a bus ticket for any other course until you receive notification to do so. 3: Enter the name of the student attending the course in the text box provided. 4: Click on your chosen ‘Pay Now’ button. 5: You will be re-directed to the secure Paypal payment page. a) If you are an existing Paypal customer login to your account and pay through that. NB: Please ensure that you enter your son/daughter’s name & course in the message box when paying by credit card. You will be sent a receipt by email after confirmation of payment (this will suffice as a bus ticket). *Please Note: All online payments are subject to a handling fee of 5% by Paypal which comes up as ‘Postage and Packing‘ in the Paypal panel. Parents who wish bring/collect their son/daughter to/back from the college can do so and travel directions will be forwarded prior to course commencement. Parents should endeavour to arrive at the college between 3 -5pm on the first day. On the last day you MUST collect your son/daughter before 10am.